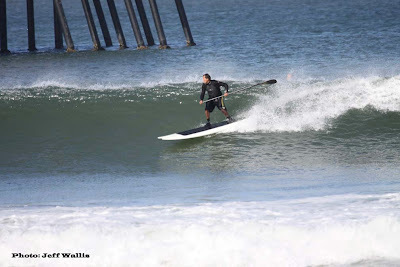 Stand Up Paddle Surfing: More Surf Photos! I warned you! We've got photo archives that are bursting at the seams- and we'll be posting up the best. If you're more into paddling through tide pools better tune out for the next few days! First, a paddlesurf.net birthday wish from Matt Miller: "Happy Birthday Melissa Miller! Your husband is so awesome and got you guys stand up paddle lessons for your birthday. Get ready to paddle!" We even got the Go Pro in on the fun. Check out the cool whitewater "tail" following me around the shoulder on this cutback- wrap that sucker!